Bucket list items are a big deal. Crossing them off with dear friends is even bigger. Donna and her husband Richard are no strangers to this idea. Together, they’ve had all sorts of adventures while traveling with their close friends Beth and Robert. In August 2018, it was time for another trip and countless more memories in the making. Understandably, one place Donna really wanted to visit with her husband and friends was the Emerald Isle. Recently, she discovered she most likely has Irish ancestry, which only further fueled her desire. With this in mind, Donna took on the role of planning the trip. Her friends and husband trusted her judgment as she began researching online. “I got to the point where I was getting very overwhelmed with all the places you could go and things you could see and do,” Donna said. Details upon details took Donna down quite the rabbit hole as she wondered just how she would manage putting together such a big journey. Then came a fragment of light at the end of the tunnel. Among her research, Donna visited the official Ireland Tourism website. She found a section listing companies that offer trips to Ireland and the United Kingdom. Like spotting a diamond in the rough (or a crystal, one might say), Donna selected Crystal Travel. Donna knew her trip was in the right hands after speaking with travel expert Ann O’brien. Ann’s parents are both from Ireland and, as a result, Ann spent a lot of time there growing up. It was only fitting for her to work in the travel industry and send people to one of her very favorite places on earth. The feeling was mutual on Donna’s end. Together, the ladies began discussing ideas and thoughts for the upcoming trip. Ann’s expertise and inside knowledge played a big role in Donna’s decision making. 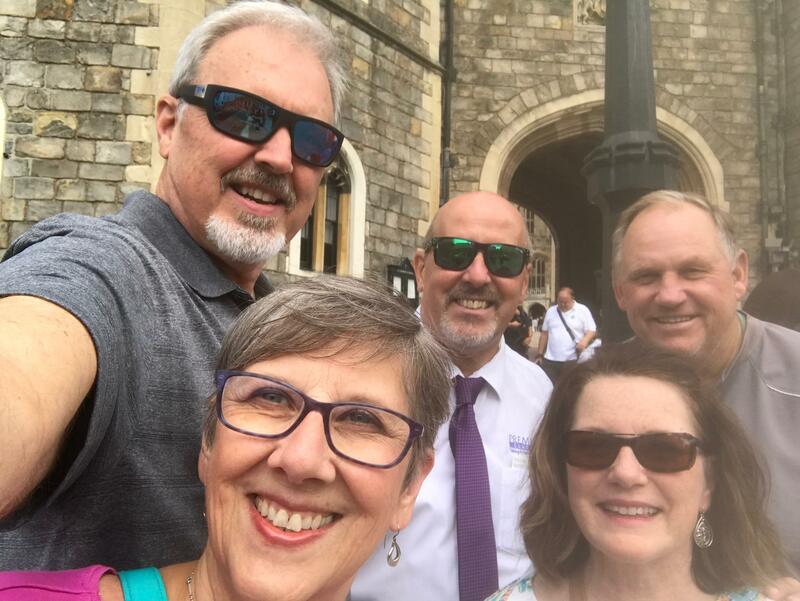 The group spent the first days of their journey in England where they toured iconic attractions like Windsor Castle. From there, they took a train to Scotland and stayed in Edinburgh for a few days. 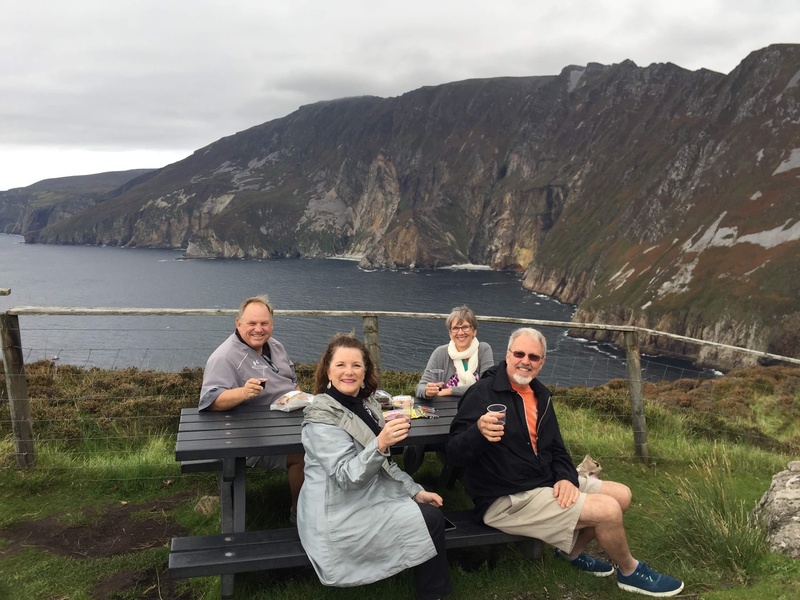 The remainder of their trip was spent seeing Northern Ireland and parts of Ireland’s Wild Atlantic Way. Donna felt much better going into the trip after receiving Ann’s guidance. Among things the group wanted to incorporate during their time in Scotland was the Royal Edinburgh Military Tattoo. An annual event, this is a series of military tattoos performed by British Armed Forces, Commonwealth and international military bands. 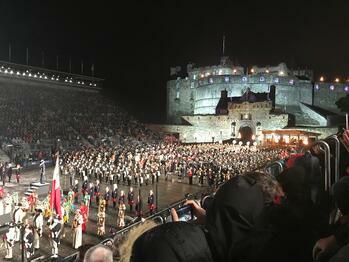 It’s held on the esplanade of Edinburgh Castle and is arguably one of the greatest shows on earth. Other friends of Donna’s attended this in the past and told her it was spectacular. This experience turned out to be a highlight for Donna, her husband and their friends. Donna felt very moved by the experience. “I bet there were people from 50 countries or more in attendance. For all of them to be singing together – it’s the kind of thing that gives you hope that people can get along, after all. The song ended with a lone bagpiper at the top of Edinburgh Castle,” Donna said. Activities like this were easy for the group to enjoy as Ann took care of all the fine details. 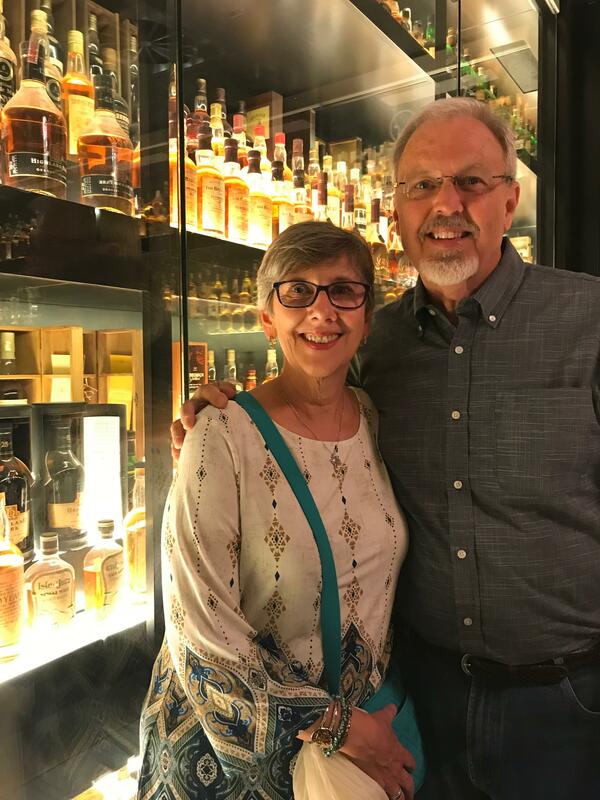 The adventures continued with a visit to the Scotch Whisky Experience. The group had a fun time getting an in-depth look at the history and makeup of the beloved drink. When Donna returned from the trip, she went over the experience with her son who also enjoys a good Scotch. While sipping some Glen Moray, mother and son discussed her Scotland adventures. “I went over all the different regions with him and how the taste comes from each region,” Donna said. When the group of friends wasn’t exploring Scotland on foot, they took escorted tours throughout the highlands. During their time in Ireland, however, they rented a car for their sightseeing. When seeing the Emerald Isle, the group of friends enjoyed stopping and going whenever they pleased. Some highlights of their Emerald Isle adventures were Bushmills, Giants Causeway and Slieve League. “Places like those were beautiful and exciting, but the people we met along the way and the places we stopped to see – that’s what really made the trip.” Donna said. The group of friends was so pleased to have the trip be such a success. Donna said a lot of that comes down to Ann and Crystal Travel. “I don’t think I could have planned this on my own. This trip speaks volumes about Ann and Crystal Travel. We’re deeply indebted to you,” Donna said. One of our favorite travel phrases comes from Moroccan scholar and explorer, Ibn Battuta: Travel – it leaves you speechless, then turns you into a storyteller. Donna’s trip with her husband and friends proves this statement is true.